Corn and soybean in NW MN need rain. Just how dry is it? 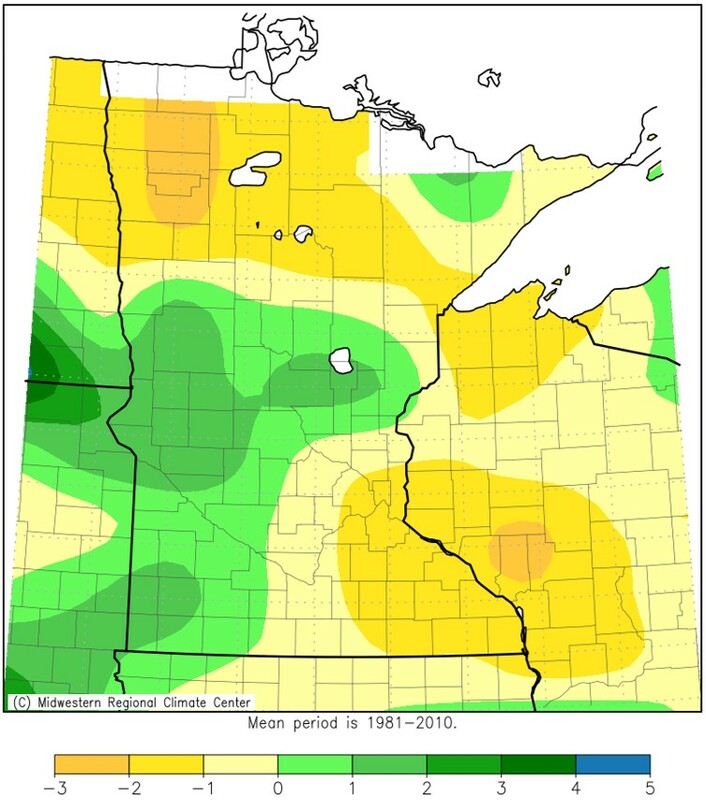 Northwestern Minnesota has been dry over the last month, with large areas accumulating between 1 and 3 inches less rain than the 30-year average (Figure 1). Figure 1. Departure from mean precipitation (in inches) for the period of July 8-Aug 9, 2018. Credit: Midwest regional climate center. After 4 days of 87+ degree temperatures and relative humidity as low as 31%, it is no wonder that soybeans and corn are exhibiting symptoms of water stress. While the US drought monitor map has reflected the abnormally dry or moderate drought conditions through much of the region (Figure 2), one can’t help but wonder why dry conditions weren’t picked up earlier and further to the west. Figure 2. 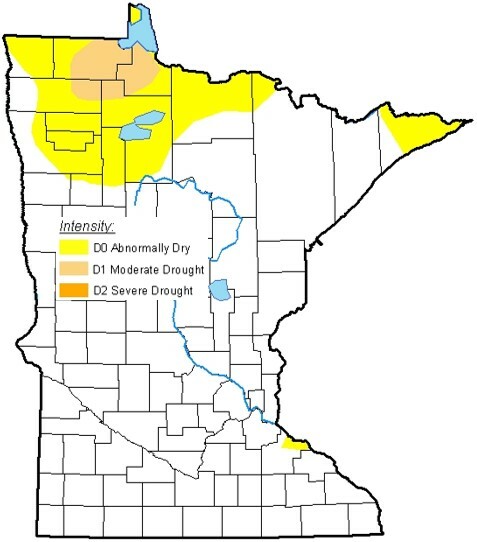 Parts of northwest Minnesota were either abnormally dry or experiencing moderate drought during the week ending August 7. Credit: US Drought Monitor. The US National Oceanic and Atmospheric Administration’s physical sciences division has a new index called the evaporative demand drought index (EDDI) that highlights areas that may experience drought in the near future. This index takes into account temperature, relative humidity, solar radiation and wind speed to estimate something called evaporative demand. Evaporative demand is a measure of how thirsty the atmosphere is or much the atmosphere wants to evaporate water from bodies of water, soil or evapotranspiration. Current EDDI values are compared to a 38-year data set and then mapped to show areas that have more or less evaporative demand than average (Figure 3). Figure 3. 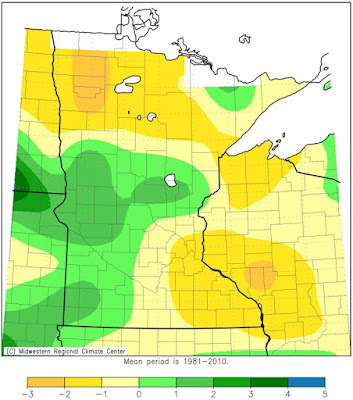 Parts of northwest Minnesota experienced more evaporative demand than average from July 5 through Aug 3, 2018. Credit: NOAA/ESRL Physical Sciences Division, Boulder, Colorado, from their web site at: https://www.esrl.noaa.gov/psd/. 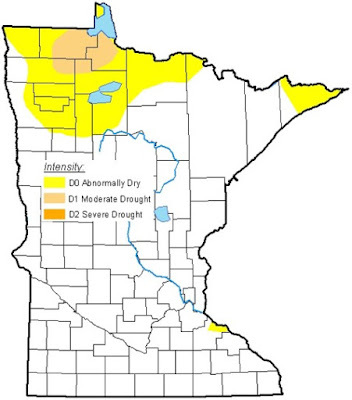 From July 5 through August 3, 2018 areas of northwestern Minnesota have only been this dry between 5 and 30 percent of the time since 1979. 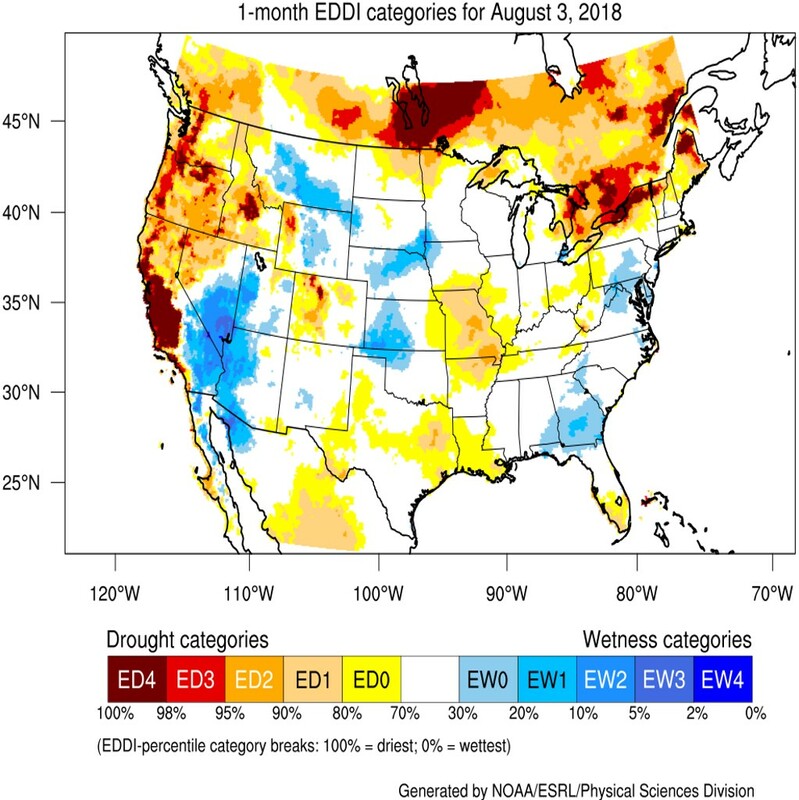 Essentially the EDDI map is showing that conditions are dry and have the potential to get drier during the critical kernel- and pod-fill stages of corn and soybean development. What drought does to soybean. Driving down the highway one can easily pick out fields of soybean suffering from water stress. 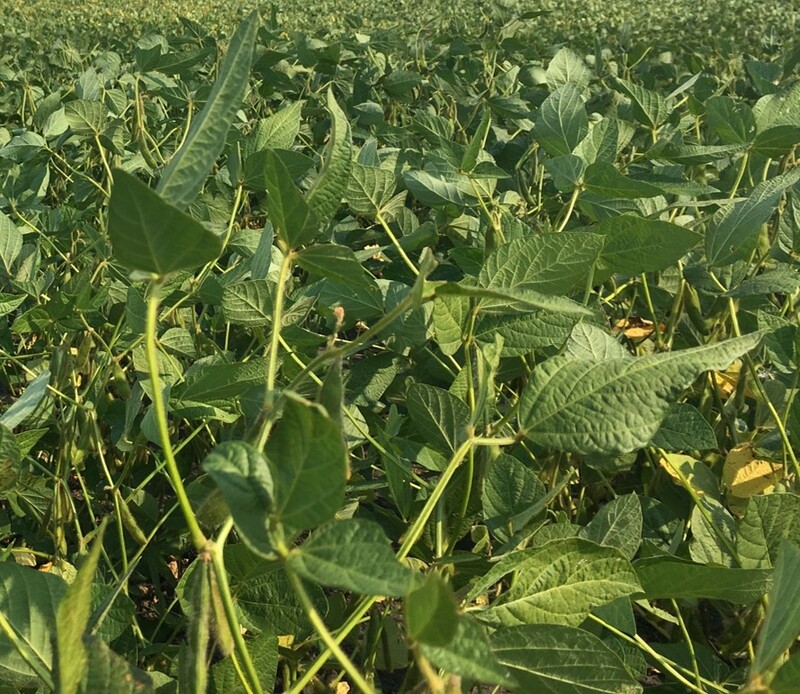 Soybean fields may appear to have large patches of plants with silvery-green leaves broken up by smaller patches of plants with darker green leaves or vice-versa (Figure 4). The dark green upper surface of soybean leaves has more chlorophyll, the green pigment that (through photosynthesis) absorbs the sun’s energy that cells use along with water and carbon dioxide to make carbohydrates. The lighter, silvery green lower leaf surface tends to reflect more of the sun’s energy, helping plants to conserve water (Casteel, 2012; Figure 5). Figure 4. Soybeans experiencing drought stress have flipped leaves, while those in field areas with more soil moisture continue to appear green (arrow). Figure 5. Soybean plants under drought stress flip their leaves so that the underside is facing up. Whether more of the plants appear to have green or silvery colored leaves facing up likely depends upon how much rain the crop has recently received, how well the soil was able to absorb and hold onto that moisture and root health and function. 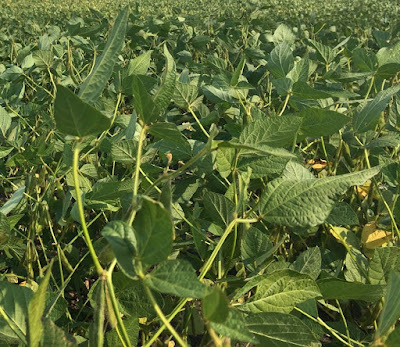 In soybean drought stress can cause fewer flowers and pods, smaller seed size and less nitrogen fixation, all of which can negatively affect yield (Licht et al. 2013). Drought stress in corn. For corn, drought stress during grain-fill can cause leaves to roll during the hottest part of the day (Figure 6). Similar to soybeans, rolled corn leaves tend to be oriented more upright, conserving water by exposing less leaf area to direct sunlight. Figure 6. Corn plants under drought stress curl their leaves. Drought stressed corn plants can also begin to show symptoms of nitrogen deficiency (Figure 7). Corn continues to take up nitrogen dissolved in water until physiological maturity (Bender et al. 2013), but under drought conditions roots may neither grow and function well nor intercept water. Nitrogen is remobilized from older leaf tissue to developing kernels resulting in yellowing or ‘firing’ in lower leaves. Symptoms caused by nitrogen deficiency begins as a yellowing at leaf tips that progresses along the midrib eventually killing the leaf. 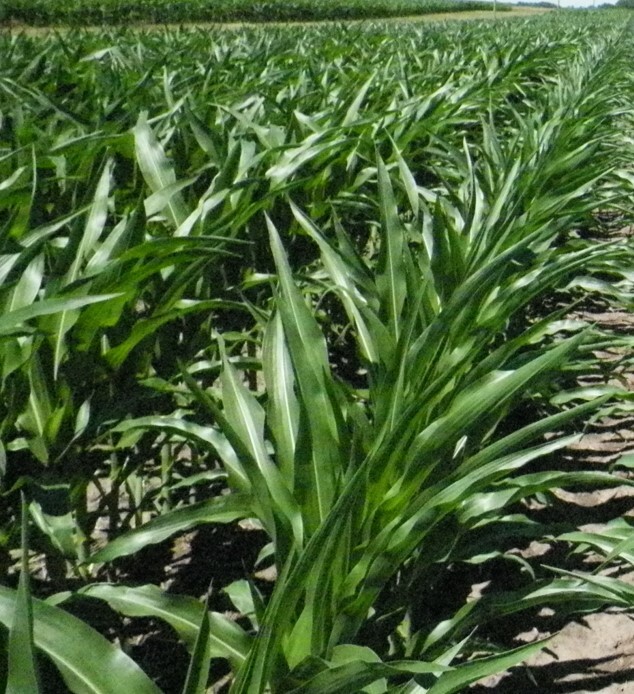 Similar to soybean plants with flipped leaves, corn plants suffering from leaf rolling or nitrogen deficiency caused by drought stress will appear in patches. Figure 7. 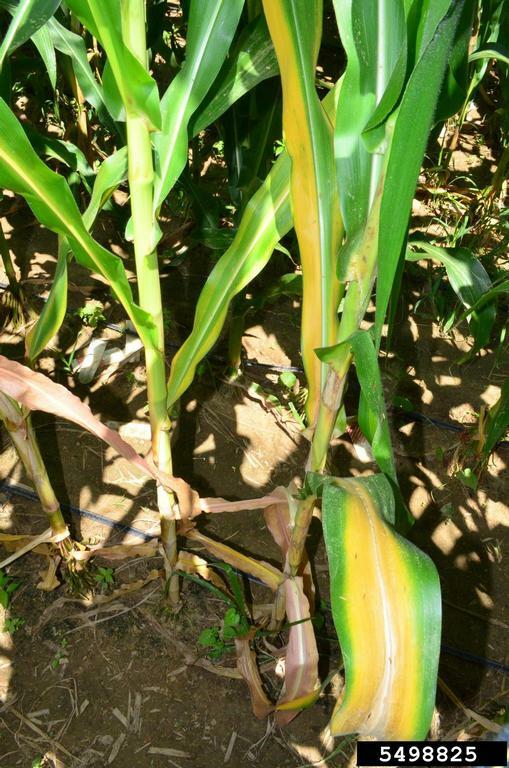 Corn plants under drought stress can show symptoms of nitrogen deficiency. Credit: Felix Francis, University of Delaware, Bugwood.org. In addition to lost leaf area, drought stress that occurs during grain-fill can result in earlier maturity and a shorter grain-fill period, lighter weight kernels and an increased risk for stalk rots and lodging (Licht and Archontoulis, 2017). Minimizing tillage reduces drought stress. While it is no consolation this growing season, conservation- or no-till practices that leave plenty of residue on the soil surface tend to both cause less compaction and help to better conserve moisture by preserving soil structure and aiding water infiltration (Licht et al. 2013). Bender, R.R., Haegele, J.W., Ruffo, M.L. and Below, F.E. 2013. Modern corn hybrids’ nutrient uptake patterns. Better Crops. 97:7-10. Online. Casteel, S.N. 2012. Signs if drought stress in soybean. Purdue Extension. Online. Licht, M., Wright, D. and Lenssen, A. 2013. Soybean responses to drought. Iowa State University Extension and Outreach. Online. Licht, M. and Archontoulis, S. 2017. Influence of Drought on Corn and Soybean. Integrated Crop Management Blog. Online.